Here’s a touching story of a Dog who worked at Ground Zero. I really enjoyed the video and think it will touch your heart too. Enjoy and I’ll keep looking for incredible dog stories that educate, inform and lift spirits. If you find a dog story that impressed you, please pass it along in the comments section. As members of Texas Task Force 1, Bretagne and her mom/handler Denise Corliss had an intense first deployment. They joined nearly 100 other search and rescue dogs to find and save people trapped in the rubble of the World Trade Center after 9/11. They’ve had an unshakable bond ever since. After hearing Bretagne’s story and learning that her 16th birthday was coming up, there was no question in our minds that she deserved a Dog’s Best Day for the ages. 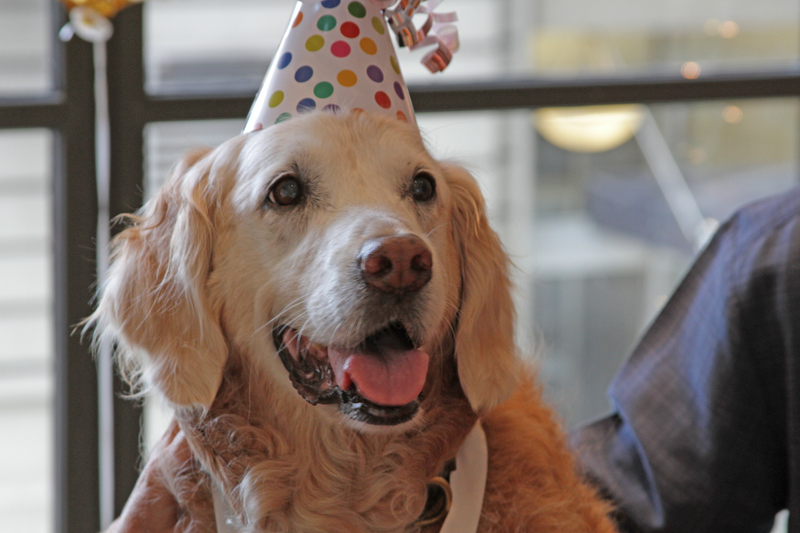 To celebrate her birthday and thank her for her incredible service, we were honored to team up with the dog lovers at 1 Hotels to bring this New York City hero and her mom back to the city for the ultimate Dog’s Best Day. Help us find our next Dog’s Best Day honoree! Email dogsbestday@barkbox.com with your deserving pup’s story. 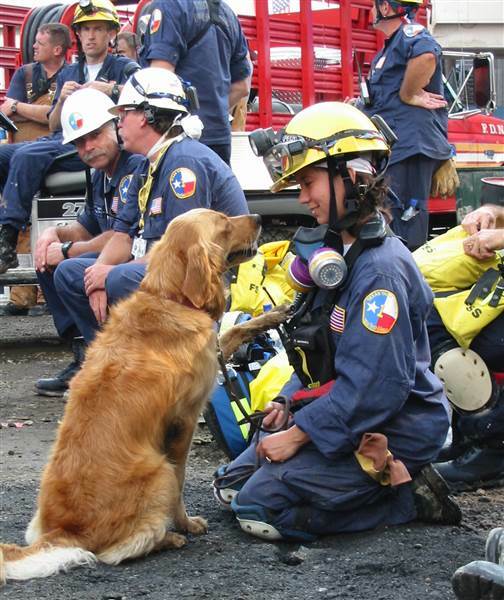 Bretagne the search dog and Denise Corliss at Ground Zero in September 2001. The dogs must be focused on the task at hand – to find the scent no matter where it leads or how much it is intermingled with other odors. The Bloodhound is celebrated for his prowess as a search dog and has been used in the southern US by police forces to track criminals for decades. The Bloodhound’s legendary nose is accepted as evidence in courts throughout the country. However, kennels that breed Bloodhounds for tracking are few and far between, Flannery said, adding that she hunted far and wide to find Kachina. Flannery said that she likes a mixed group of dogs in her group because different breeds have different skills and levels of endurance. Other favorite breeds for general search and rescue work are German Shepherds, Belgian Malinois, and Golden Retrievers, but any medium-to large breed or mix can serve just as well if they enjoy tracking and can concentrate on following the scent. Kentucky Search Dog Association, part of the state emergency services department, has Weimaraners, Smooth Collies, and Rhodesian Ridgebacks among its teams along with GSDs and retrievers. Southwestern Ohio Search and Rescue has a Giant Schnauzer, an Australian Shepherd, and a couple of mixed breeds, and a group in Virginia has several Border Collies and Australian Shepherds along with more common breeds used in search work. “The breed isn’t critical,” said Sarah Stuart of SWOSAR, “the attitude is.” Her dogs are Belgian Malinois. Whatever the breed, search dogs must be evaluated before they can join a group. Dogs with a strong play drive are preferred, Flannery said, dogs that like games of fetch and will work for rewards. In training, dogs are rewarded with play and treats when they locate an acting victim; in an actual search, the victim often cannot respond when found, so handlers must be quick to provide the praise, often in a low-key manner after removing the dog from the vicinity of the find. Dogs are trained to follow the scent in different terrain and weather conditions and to identify cadaver scent in bodies of water. Their skills are sharpened through regular training sessions and by handlers with daily training at home. If you’re in the Palm Springs area, you’ll find me at the COD Street Fair every Saturday and Sunday, Lot C Space 332A. I look forward to spending some good fun time with you. Please drop by and get your hug from the hugging artist.